Rakhi festival is a day to celebrate and cherish one of the most sacred relationships on this earth. The celebration of Rakhi takes place amidst loads of gaiety and merriment. Every year, this festival falls on the month of August or September according to the English calendar. Traditions of Raksha Bandhan are centuries old and they have been followed since ages with the same zeal and enthusiasm. People generally start shopping for beautiful Rakhis nearly a month before the festival. Some people also like to make Rakhi at home. Many brothers and sisters keep fast on this day. Ladies cook delicious dishes and sweets for the day. After taking bath early in the morning, they worship to God and seek his blessings. 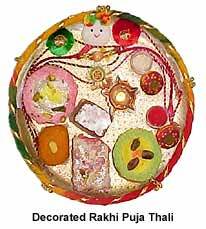 After worshiping to God, sisters decorate the puja thali and keep Rakhis, rice particles, kumkum powder, diya and sweets on it. After doing aarti of their brothers, they put tikka on the forehead of him and tie rakhi on his wrist. Then they pray to God for long and prosperous life of their brother. In turn, brothers promise to protect their sisters in every adversaries of life. The ceremony of Rakhi tying follows with the exchange of beautiful Rakhi gifts. As a token of love, these gifts memorialize this auspicious day for many years to come. The entire Hindu society have a strong believe in the tradition and custom of this festival. The day of Raksha Bandhan is the emerald celebration of love and affection which is enjoyed by every member of the family. With the spirit of unity in diversity, India celebrates rakshabandhan with different hues and colors of love and affection. The rituals of Rakhi festival has been there since ages. Known with different names in different parts of the country, Raksha Bandhan is celebrated by following different rituals in every region. Rakhi festival is known as Narial Poornima or Coconut Full Moon in Maharashtra. This is because the coconuts are thrown into the sea to appease the sea god, Varuna. It is religiously believed that the three eyes of the coconut are the three eyes of Lord Shiva. The festivity of the day not only indicates towards the bonding of sisters and brothers but also affirms the belief in values and traditions. Avani Avittam is another name given to the festival of Raksha Bandhan. This name is well-known in Sounthern India. On this auspicious day, the brahmins take out their Mahasankalpam or thread and wear new thread called Janeyu or Yajnopavit. By offering libations of water they penance for their mistakes which they have committed in past one year.